Bizen Kanemitsu (備前兼光) was the son of Bizen Kagemitsu (備前景光) who was the son of Bizen Nagamitsu (備前長光). He was also the great-grandson of the founder of the Bizen Osafune School, Mitsutada (光忠). Because of the long working period of this smith, there are two schools of thought about whether there were one or two generations of smiths who used the name Kanemitsu (兼光). Those who subscribe to the two-generation theory refer to the first generation as O-Kanemitsu (大兼光)and the second generation as Enbun Kanemitsu (延文兼光). A blade dated 1331 is the oldest dated example of the work of Kanemitsu (兼光). His works from this period until the Koei era (1342-1344) resembled those of his father, Kagemitsu (景光), whose sugata shows features typical of the late Kamakura period with hamon that are uniformly kataochi gunome consisting of nioi with a mixing in of square-shaped gunome, and there are such activities as minute ashi and yo. Beginning around the Koei era (1342-1344), the workmanship of Kanemitsu (兼光) changed markedly. 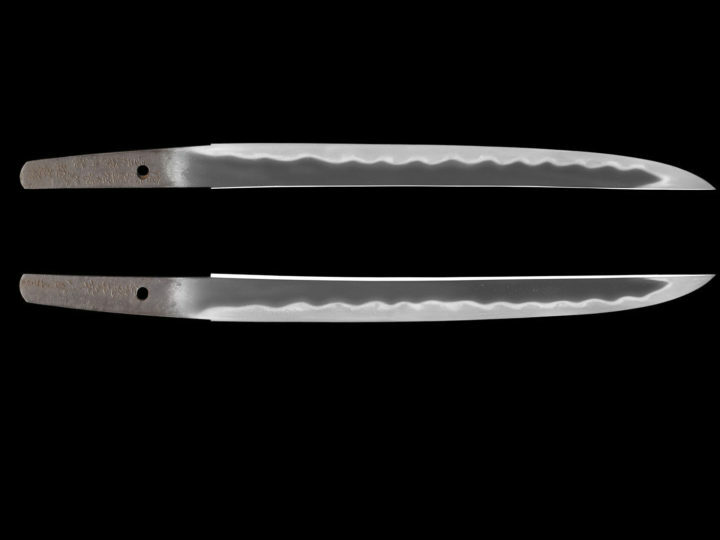 After this period, tachi with prolonged kissaki, tanto, and wakizashi with markedly stretched width and length came into existence. The notare hamon that was first introduced about this time came to gain popularity by the Bunwa and Enbun days (1352-1360). The works produced in and after the Kano (1350-1351) days began to show elements of Soshu influence mixed with the native Bizen style. Since the mid 1980’s the thinking of many sword experts, including Tanobe sensei has reverted back to believing in a single generation of Kanemitsu (兼光). After all, if there were two generations of smiths by this name, they worked in a very close time frame with no clear chronological line established to distinguish two generations. For this reason, it is not beyond the realm of possibility that there was only one generation and he changed his sword making characteristics to comply with the changing times as the Nanbokucho Era came into being. Tomomitsu (倫光), Yoshimitsu（義光, Yoshikage (義景), Hidemitsu (秀光), Motomitsu (基光), Masamitsu (政光), Toshimitsu (利光), and Shigemitsu (重光) belonged to the school headed by Kanemitsu (兼光). The work of each member of this school had some distinctive features, but the basic characteristics of the Kanemitsu (兼光) school of workmanship are outlined below. SUGATA: EARLY PERIOD WORKS: Typical Kamakura tachi shape with marked koshi-zori and funbari. His sugata was close to that of his father, Kagemitsu (景光). His tanto lacked sori and averaged around 24 cm in length. 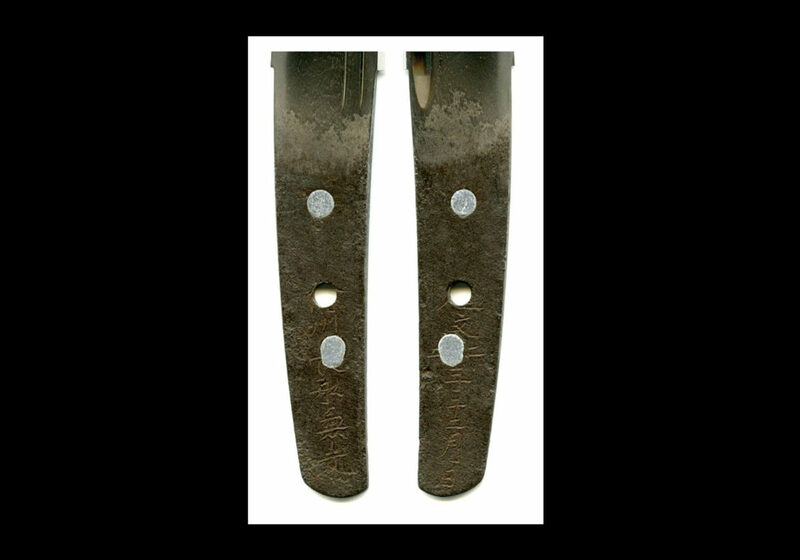 LATER PERIOD WORKS: The ubu swords of this period came to have the longest nagasa in Japanese sword history with swords of up to 90 cm being not uncommon. Most of the remaining examples are o-suriage (shortened) and mu-mei (unsigned). The mihaba is wide, with almost no difference in width at the bottom and the top. Sori will be shallow. The kissaki is large, with a fukura which is not rounded. Hira-niku is scarce. The shinogi is high and the shinogi-ji is narrow. In tantô, the nagasa ranging from 30 cm to 35 cm, the mihaba is relatively wide, hira-niku is scarce and the kasane is thin. 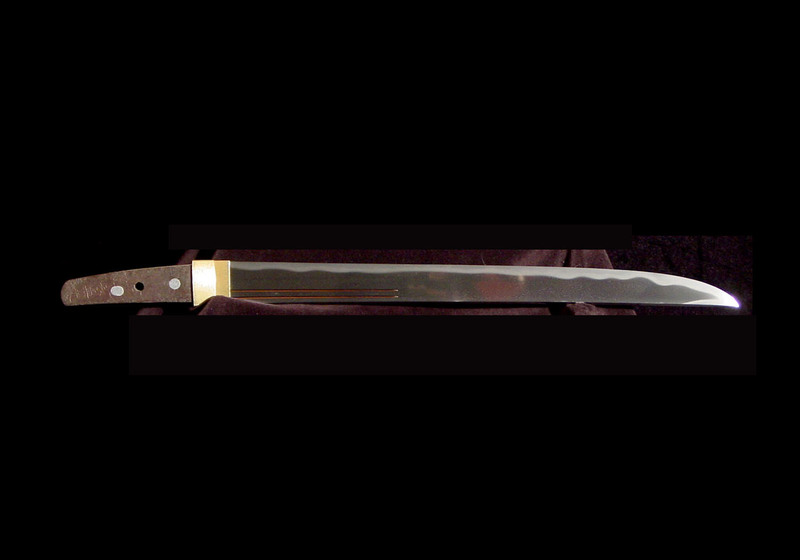 JITETSU: The jigane is well forged and soft. Most often we find a kitae of itame mixed with mokume forming many chikei. Utsuri appears as midare-utsuri or bo-utsuri or a combination of both is found with the chikei. Usually it is not as strong as found in the works of his father and grandfather. HAMON: EARLY PERIOD WORKS: The hamon is narrow, but when kataochi-gunome is present, the pattern is larger than Kagemitsu’s (景光). Generally, he either produced a sugu style hamon with a mixing in of gunome or a kataochi style gunome hamon, so that the hamon he tempered were generally like those inherited from his father, Kagemitsu (景光). LATER PERIOD WORKS: In works produced in his later period we find a notare mixed with gunome and sprinkled with nie grains as being his most common. Kataochi gunome can still be present, but there is a definite trend towards more profuse nie showing the Sôshû influences of his later years. BÔSHI: His distinctive bôshi, called “Kanemitsu bôshi“, is midare-komi with a short turn-back that is tapered with nioi at the top, resembling a candle flame. 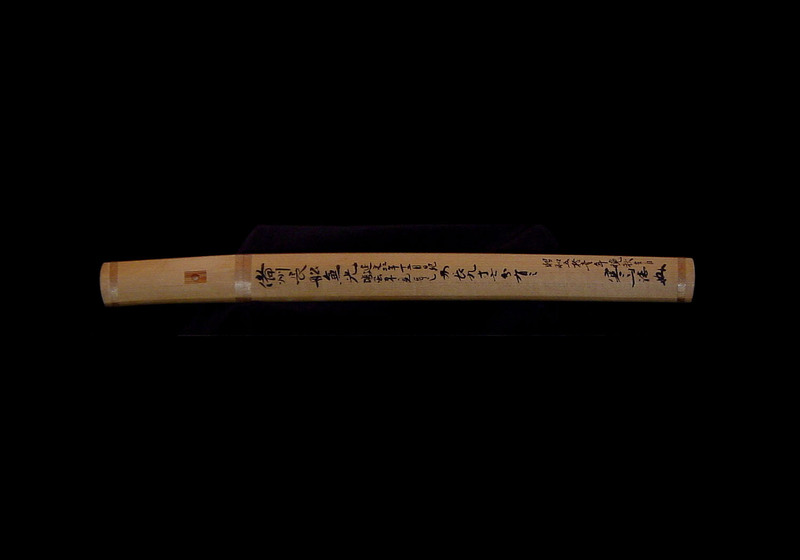 HORIMONO: In addition to hi, such horimono as ken-maki-ryu (dragon winding around a sword), bonji, tsume-tsuki-ken (a sword hilt with claws), dokko-tsuki-ken (a sword with a handle), and the names of the gods and deities are skillfully engraved. NAKAGO: Kanemitsu’s tantô nakago will be typical Bizen with straight sides and a rounded kiri. Occasionally a furisode style nakago will be found. 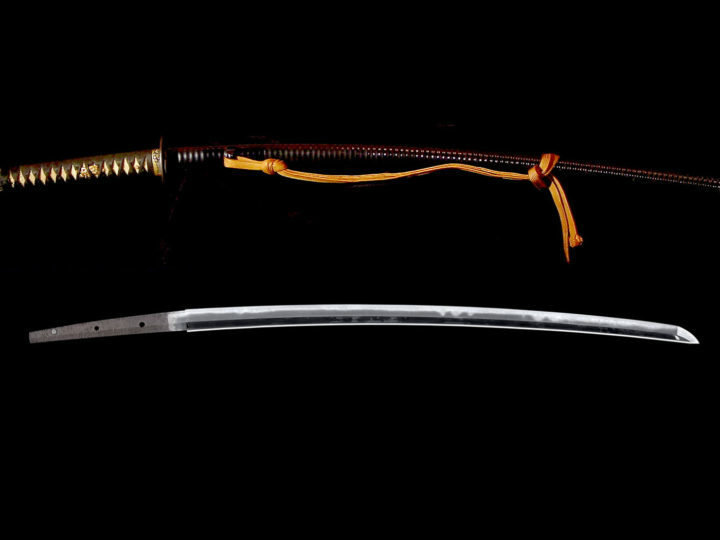 Most of his long swords have been shortened with the original nakago being lost, but on those ubu examples that exist the nakago will be long with a slight curvature and a ha-agari-kurijiri. The yasurimei will be katte-sagari. Designated Juyo Token at the 61st shinsa held on the 20th of October 2015. Tanto: Bishu Osafune Kanemitsu; Enbun yonen juni-gatsu hi (a day in the 12th month, the 4th year of Enbun, 1359). Dimensions: Length: 29.1 centimeters; Sori: 0.1 centimeters; Width at the Base: 2.4 centimeters; Nakago Length: 9.6; Nakago Curvature: 0.1 centimeters. The construction is hira-zukuri with an iori-mune. The blade is somewhat wide, and in comparison, to the width, the blade is long. The blade is thin, and the curvature is shallow. The kitae is itame-hada mixed with mokume that is covered in minute ji-nie. The jigane contains abundant chikei and faint utsuri. The hamon is shallow notare based with ko-notare and a mixing in of ko-gunome. There is ko-ashi activity, and the nioiguchi is somewhat thick. The habuchi is well covered in ko-nie, and there is kinsuji activity with streaks of sunagashi. The boshi is notare-komi with a ko-maru and somewhat long kaeri. From the base of the koshi on the omote, there is a gomabashi carving that extents onto the nakago, and on the ura there is a carving of a koshi-bi with a soe-bi that similarly taper off onto the nakago. The nakago is ubu, and the tip is an extremely shallow ha-agari-kurijiri. The yasuri are sujikai, and there are three mekugi-ana, of which two are filled. Running down the center of the sashi-omote is a long signature that is interrupted here and there by the second and third mekugi-ana. There is a date similarly placed on the ura. Description: Kanemitsu succeeded Kagemitsu as the direct descendant in the Osafune School. His extant dated works begin from the late Kamakura period during the first year of Genkô (1321) to Joji (1362-1368) during the Nanbokucho period, amounting to an extended length of about 45 years. Regarding the works made up to Koei (1342-1345) during the early part of Nanbokucho, both the tachi and tanto have average shapes, and the hamon are sugu in style with a mixing in of gunome, or, he tempered in a kataochi style gunome, which gives them a feeling of entirely following in the footsteps of his father, Kagemtsu’s style of workmanship. However, from around Jowa and Kanô (1345-1352), the shapes become large patterned, and hamon that had not been seen up until now become essentially notare. 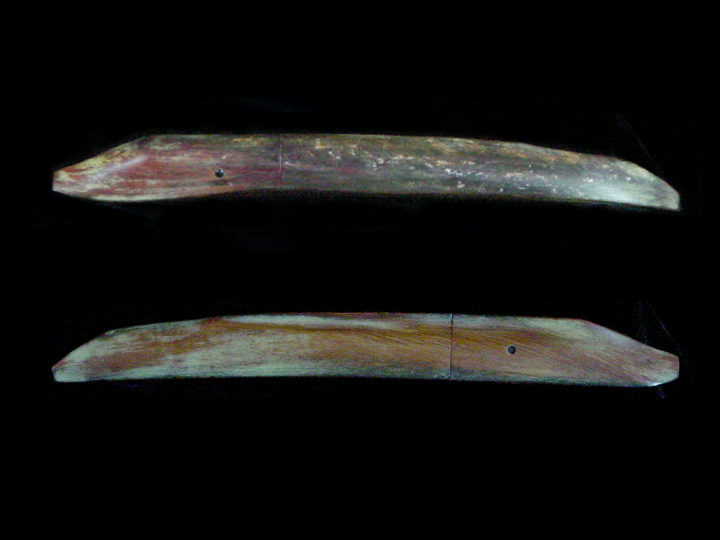 During circa Bunwa and Enbun (1352-1361), such hamon are often seen. As for this tanto, the kitae is itame mixed with mokume that is covered in minute ji-nie. The jigane contains an abundance of chikei, and there is faint utsuri. 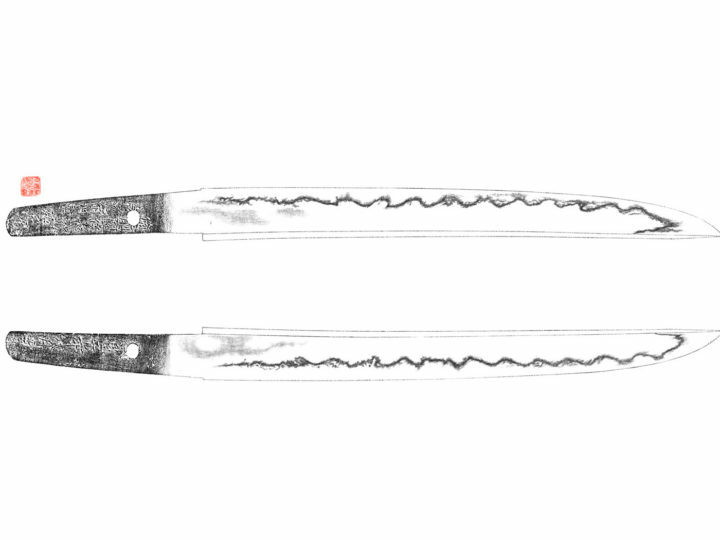 The hamon is essentially shallow notare with ko-notare and a mixing in of ko-gunome. There is ko-ashi activity, and the nioiguchi is rather thick. The habuchi is well covered in ko-nie, and there is kinsuji activity with streaks of sunagashi. The appearance of this style of workmanship clearly displays the entire style of workmanship in Kanemitsu’s late period works. The excellence of the very well worked kitae with its thick covering in minute ji-nie is in addition to the excellent state of preservation, making this a masterpiece among similar works.